We all brush our teeth regularly every day but the question is how properly we are able to brush our teeth. The problem with the traditional brush is that it’s hard to reach some spots of our teeth that we miss out in our regular routine, it stars the problem with your teeth in long run. if you are cared about your teeth and looking for a better alternative to the normal tooth brush, here we are with the answer. Brush head specifications: 24 × 11 × 16mmThe toothbrush is programmed into the intelligent reminder function, and within a scientific and reasonable 2 minutes, every 30 seconds reminds to replace an area to ensure that the mouth is clean and does not leave a dead angle. 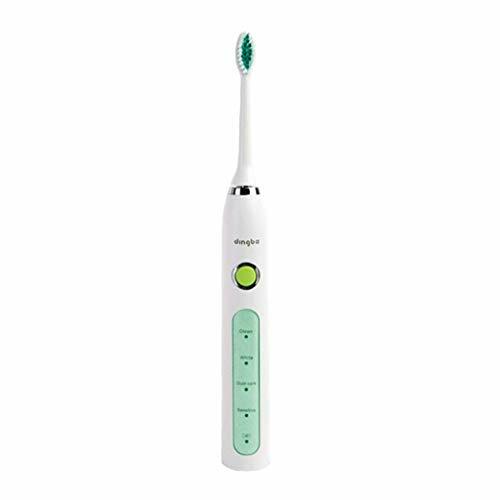 The gear memory function, after each use, the toothbrush will memorize the selected mode. The next time you turn it on, the automatic jump will be executed in the memory mode, taking care of your usage habits. 5mm wide width, release more tooth cleansing power, maintain scientific up and down brush mode, effectively clean the dead corners of the mouth, relieve gum pain and bleeding. 27000~32000 times/min frequency stable output, four cleaning modes to meet the needs of different groups of people. USB inductive charging, we do not distribute adapters, you can plug directly into your computer, mobile phone, etc.